If you are spontaneous and you love Spain this is the perfect surprise deal for you! From only 709 DKK, you can take a 3-days trip to sunny Gran Canaria with this great Sunweb deal. Included in the price are the flights and 3 nights in a good apartment on the beautiful island.? If you want to go on this trip that cheap you have to book the Sunweb deal with a group of 3 persons. For a trip with 2 persons you’ll only pay 1039 kr. The interesting part about this deal is that you don’t know in which hotel you will stay, it’s a suprise. 😉 But don’t worry the deal includes definitely an apartment which is suitable for 3 persons and fully furnished. You’ll be staying in Playa del Inglés where beautiful beach and relaxing outdoor spots are waiting for you. 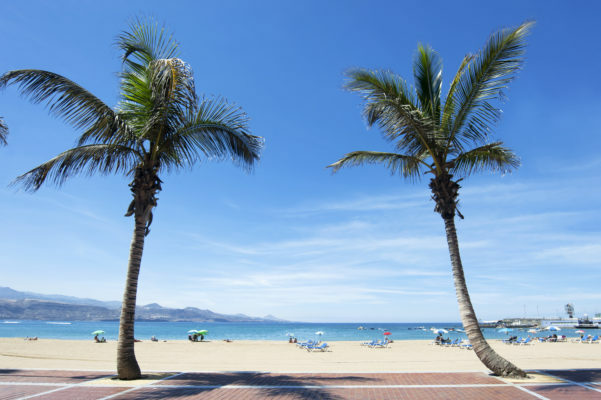 You fly from Copenhagen direct to Las Palmas with Norwegian Air. Included in the price is one piece of checked luggage (20 kg) and one piece of hand luggage (10 kg). There are dates available from February – March 2017. The cheapest date is on the 02/27/17. ? When you visit the island Gran Canaria you shouldn’t miss visiting the Roque Nublo mountain and enjoy the breathtaking sundown!